Post subject: Ford Win at Bathurst! 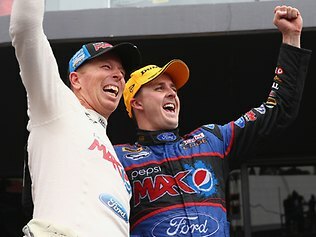 FORD'S Mark Winterbottom has won his maiden Bathurst 1000 title after a dramatic finish on Mount Panorama. He held out V8 Supercars series leader and defending champion Jamie Whincup in the five-hour epic while a fast-finishing Craig Lowndes celebrated his 20th Bathurst and 500th career start with third. Remarkably Winterbottom had never reached the podium in 10 Bathurst starts before this year's race. It also marks the first Bathurst triumph for factory-backed Ford Performance Racing (FPR), boosting the Blue Oval's overall Mount Panorama tally to 20 wins. The victory came a day after Ford ended speculation and confirmed it would support FPR again next year despite announcing in May it would cease manufacturing in Australia and retire the Falcon by 2016. The stirring win by Winterbottom partnered by Steven Richards almost made up for the devastation of 2007 when he led with 10 laps left only to slide off the track, a moment Winterbottom rated “one of the lows of my career”. Besides Winterbottom's drought, the win also ended FPR's frustration on the mountain. Despite starting on the front row in six of the last seven Bathursts including three pole positions the team had not been able to get on the podium, let alone win. FPR's last podium place was in 2004. Winterbottom had to earn it, holding out desperate four-time winner Whincup partnered by Paul Dumbrell in a final sprint to the line in wet, blustery conditions. Whincup's Holden teammate five-time champion Lowndes who was partnered by Warren Luff was third in his 20th Bathurst and 500th career race start. Winterbottom eventually held out Whincup by 0.47 of a second the fifth year in a row that less than a second separated the top two. The stage was set for an intense sprint finish when Winterbottom snuck in front of Whincup to effectively take the race lead when he emerged from the pits after 138 laps with both having had their mandatory seven stops. All eyes were justifiably on the pair after their spectacular qualifying duel yesterday, narrowly won by the series leader. But a barnstorming finish by Lowndes and Garth Tander threatened to steal the show, tearing around the course at one stage a second faster than race leader Winterbottom despite falling rain. Finishing with a wet sail, Lowndes set the race's fastest lap in lap 145 only for Tander to snap it two laps later. Holden veteran Jason Bright tried desperately to hold them out in third spot, but in a remarkable move both passed him with three laps to go. Every car had to have seven mandatory pit stops during the race to cater for newcomer Nissan and Mercedes' fuel economy issues. It ensured the lead changed hands throughout the race and at one stage Holden's international import Mattias Ekstrom held it despite arriving at Bathurst without driving a V8 Supercar before. There were only two safety cars after Todd Kelly's Nissan hit a kangaroo on lap 20 and Holden veteran Greg Murphy crashed into the wall at 135km/h on No.86 in a major blow to his co-driver James Courtney's title hopes. Post subject: Re: Ford Win at Bathurst!